It is not uncommon for people to use the same password (or variations) across multiple sites and applications. Windows Hello and other biometric authentication features like Apple’s Face ID or Touch ID are designed to offer an alternative to passwords that is unique and more secure because it relies on technology that’s harder to break. Windows Hello limits the attack surface for Windows 10 by eliminating the need for passwords and other methods under which identities are more likely to be stolen. “Windows Hello lets a user authenticate a Microsoft account or a non-Microsoft service that supports Fast Identity Online (FIDO) by having the user set up a gesture” such as a facial scan, iris scan or fingerprint to log into a device, said Anoosh Saboori, senior program manager lead at Microsoft. “Windows Hello uses 3D structured light to create a model of someone’s face and then uses anti-spoofing techniques to limit the success of people creating a fake head or mask to spoof the system,” Moorhead said. 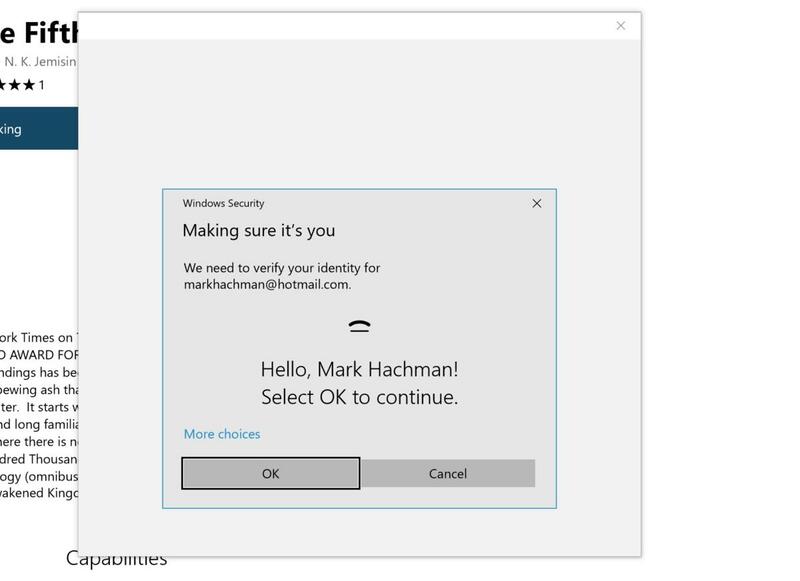 Windows 10 users can set up Windows Hello in the sign-in options under account settings. Users need to establish a facial scan, iris scan or fingerprint to get started, but they can always improve those scans, and add or remove additional fingerprints. Once set up, a glance at their device or scan of a finger will unlock access to Microsoft accounts, core applications and third-party applications that use the API. “By adopting [the] FIDO specification, partners will be delivering differentiated and innovative Windows Hello companion devices that meet the needs of both consumers and businesses, including those in heavily regulated industries,” said Saboori. The FIDO specification was developed in 2014 by the FIDO Alliance, which now includes more than 250 companies, but was founded by PayPal, Lenovo, Nok Nok Labs, Validity Sensors, Infineon and Agnitio. FIDO authentication technology is available in hundreds of devices today, according to the group. Windows Hello is designed for both enterprises and consumers, and is gaining traction on both fronts. During Microsoft’s Ignite 2017 conference in September, the company announced more than 37 million people were already using Windows Hello and more than 200 companies had deployed Windows Hello for Business. At the time, the largest enterprise deployment outside of Microsoft’s IT team comprised more than 25,000 users, according to the company. “Biometric fingerprint scanning is prevalent in the enterprise, but the issue is that it’s not readily used,” Moorhead said. Every major vendor has systems using Windows Hello, according to Moorhead, but market penetration is much lower than needed to start the process of replacing passwords for all Windows 10 users. Though Windows Hello has a sizeable user base, it is dwarfed by the massive Windows 10 install base. If Microsoft can convert the majority of Windows 10 users to Windows Hello, it would be a watershed moment in the battle against clunky passwords. Why would you want Windows Hello? Passwords, in short, are a drag. In this age of password abundance (and human forgetfulness), security-minded users realize that a fingerprint, facial recognition or an iris scan to gain access to devices, important accounts and data is likely to be a safer option. Even so, the password “remains the most frequently used sign-in mechanism, but also a source of frustration for end users,” said Raul Castañon-Martinez, senior analyst at 451 Research. Microsoft is working with a growing number of service providers to give its users a more seamless method to authenticate multiple accounts of importance with Windows Hello. There’s a small group of Windows Hello-compatible apps on the market today, but Microsoft says more are coming. Among the apps that can use Windows Hello now are Dropbox, Enpass, OneDrive, One Messenger and OneLocker Password Manager. Windows Hello has a relatively low barrier to entry, but it does come with specific hardware requirements. 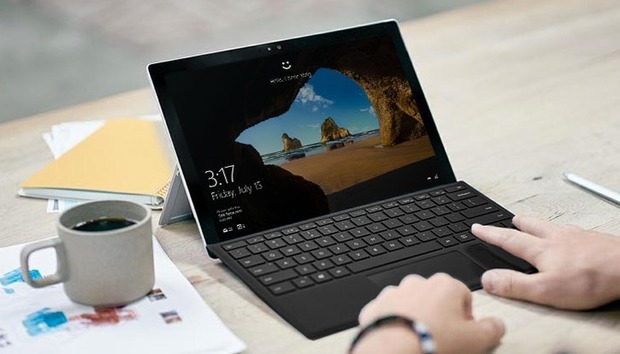 Microsoft’s Surface Pro, Surface Book and most Windows 10 PCs equipped with fingerprint scanners or cameras that can capture two dimensional infrared spectroscopy are compatible with Windows Hello. Compatible devices from other manufacturers include HP’s Spectre X360 13, ASUS Transformer Mini T102HA and Dell XPS 13 9360. Moreover, false reject rates for fingerprint and facial recognition scanners without anti-spoofing or liveness detection must fall under 5%. False reject rates for fingerprint and facial recognition scanners with anti-spoofing technology must fall under 10%, according to Microsoft’s guidelines. For those not familiar with the technology, liveness detection does pretty much what it sounds like: it determines that a user is a living being before unlocking a device or app. All sensors must include anti-spoofing measures like liveness detection, but the configuration of these anti-spoofing features is optional and varies with different systems. In addition to the built-in option, third-party devices allow Windows Hello to be added to other Windows 10 hardware. How does Windows Hello stack up against Face ID? Windows Hello doesn’t have direct competitors because of its exclusivity to Windows 10 devices, but it does face indirect competition from the likes of Apple, Samsung and others who provide similar technology for their devices and related ecosystems. Apple’s Face ID is now in use on the company’s popular iPhone X, and is expected to rollout to other devices in 2018, including, perhaps the iPad, and less-expensive phones next fall. “Windows Hello has been around since 2015, but as usual it was not until Apple came out with a similar feature that this technology got more attention,” said Castañon-Martinez. The delayed recognition could actually benefit Microsoft because Apple is drawing more attention to Face ID and helping users become more familiar or comfortable with the technology, according to Castañon-Martinez. 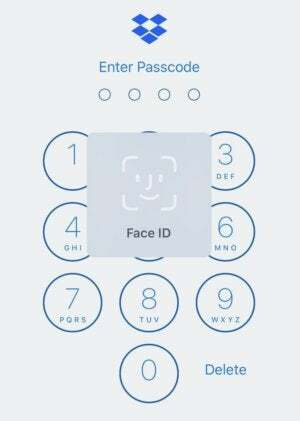 “The initial reaction to Face ID seems to be skepticism and a lack of trust from users,” Castañon-Martinez said. That’s not uncommon for a new technology. More people are likely to embrace facial recognition biometrics as more devices with the technology are introduced and sold, he said. What’s next for Windows Hello in the enterprise? Despite Windows Hello’s slow start and a delayed uptick in usage, Castañon-Martinez is convinced it will become a standard feature available across devices. Moorhead said the onus is on businesses to push for greater adoption.